This is one of those books that I’ve always heard of but never had gotten around to reading. I can’t really tell you why; it just never seemed like something I’d be interested in. Thank heavens for book groups. Framed as an interview with retiring robopsychologist, Dr. Susan Calvin, it’s a series of interconnected short stories detailing the evolution of robotics in the “future”. 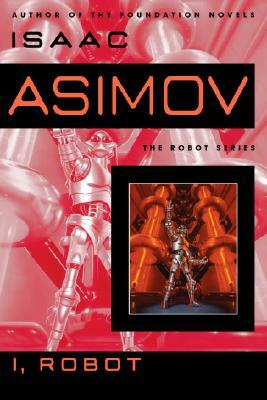 It’s an interesting look into what Asimov thought our future would be like, and the prevalence of robots in society. I’m not quite sure what to say about the book other than I really, really liked it I thought it was fascinating to read about what Asimov though the future would be like. I liked the character of Dr. Calvin; she was an interesting person to frame the book around, smart and capable (if a bit cold), and gave the book a good grounding. In fact, the stories went down better for me than short stories usually do, mostly because they seemed like chapters in something larger. That said, two of my favorite stories were “Liar”, in which a mind-reading robot just tells humans what they want to hear; and “Little Lost Robot,” in which a robot goes missing, hiding in the midst of a bunch of other robots that look exactly like it. I found it fascinating the things the psychologists and scientists go through to figure out which one is the missing robot. But my favorite was one near the end, “Evidence,” where a man is running for mayor of the region, but there are allegations against him: he’s a robot. The point is to prove he’s not. It’s a fascinating look at the line between robotics and humanity, and the issues about whether or not it’s ethical for a robot to actually “act” human. It’s a good work, one that stands up to the test of time, even if there were moments when I cringed at the 1950s-ness of it all. Even so, I’m glad I had the chance (finally!) to read it. Wasn't there a movie about this … I think so. Anyways the story it's self isn't one of interest. But thank you for sharing your thoughts. So, can you solve a mystery. As far as I can tell, the story from the I, Robot movie was not in the I, Robot book. How did they do that? I mean, it was good, it was consistent with the overall theme, but it wasn't anything like the book. I loved this one too. I was surprised at how psychological it was, and that's what I found so appealing. I loved “Liar” and “Evidence.” There were a couple of the others that I got slightly annoyed with the bickering between the two guys, but not too much.